to ensure that we are evolve as per the need of the hour. We make sure we retain the best practices while im proving upon anything that needs our attention. 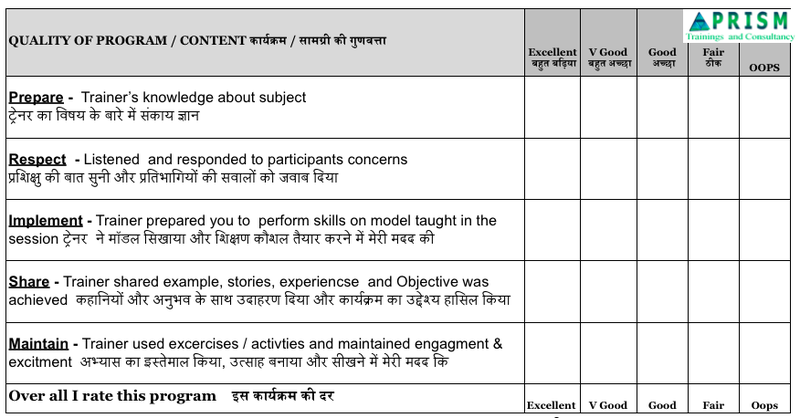 Our Feedback is usually based on the PRISM PHILOSOPHY, developed by Anubha Walia and followed by many. Consistently having above 4.6/ 5 score from decade. Rajiv – Manager HR – IT Industry : TTT Program Ms.Maurya has been consistently good human being of this earth. Actually her positive energy which creates an impact on everything she does. It has been my privilege working with her or many training programs as participants & as a coordinator as well. As a participant, my inputs for him will be “She is disciplined, methodical, organized and creative. Her ability to connect people, inspire the audience and presentation skills are amazing. I recommend her for behavioral training programs as facilitator & as a coach. Her passion towards sharing knowledge is unbeatable. As a coordinator, I would simple say that she is structured & committed. ROI of her training has been on a higher side of scale. She is persistent, polite, and always professional. She has a tremendous work ethic, incredible passion for the business, a positive attitude, and have earned excellent feedback from participants consistently always. Pankaj Kumar Rai, Manager (Construction), EIL. : PLANNING ORGANISING & PDCA Program: I don’t have words with me to explain the importance of such programme at least for me. I can only say that Training programme was simply excellent and covered aspects which we take for granted and highlight measures of making improvements by proper (SMART goal) planning before execution is in place. As of today with my experience, I can say planning definitely helps is saving my precious time and avoid surprises at later date in my day today routine. Thanks, Mam for delivering/ facilitating such a excellent, beautiful and structured Training programme for me. I can only say, As being Trainer/ facilitator you are spreading awareness “Art of Living- Building the team for leading a better lifestyle” among people. Manish Kumar – Sales Head In our Negotiation skills workshop With her relentless pursuit of excellence, motivation and her knowledge of art, she brings wealth of knowledge and skills in any training she conducts. Chetan Rao Business Excellence Head BOSCH : LEADERSHIP Consultancy : I am associated with Prism for the past 2 years or so on Leadership evaluations for top management at Bosch Nasik. She has been very instrumental in understanding the Bosch Leadership guidelines and frame questions according to our business need to develop leaders at Bosch Nasik. We are very happy to have been associated with Prism Trainings and Anubha and look forward to longer relationships in the field of training and surveys. AJAY GOYAL Product Manager : Packaging Industry : Six Sigma & 5S :MsMaurya is a versatile trainer. She is passionate about her work and compassionate as a person. She treats her trainees with comfort and has been instrumental in designing effective and do- able learning paths for each individual. She is a sincere and committed individual with good people relationship skills. It was a pleasure to be her participant in program with her in Goa. 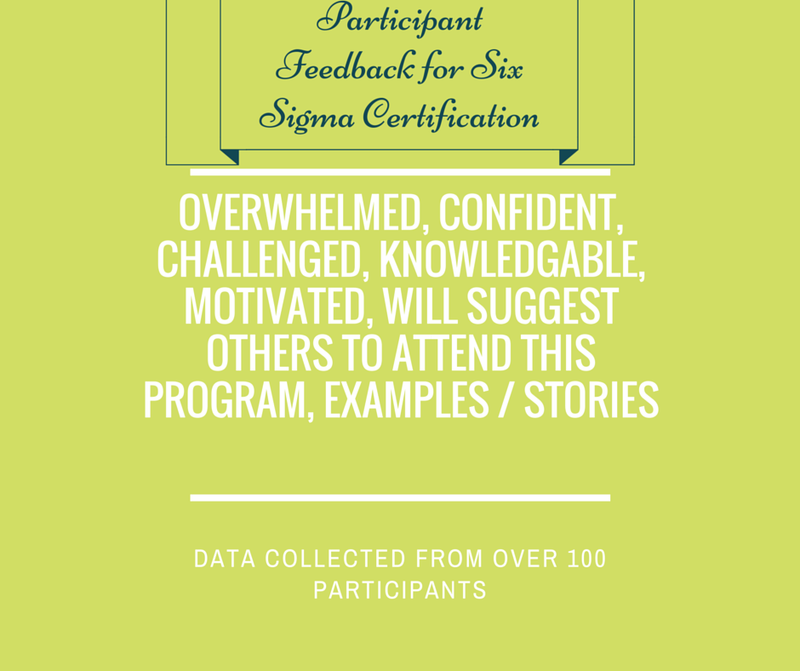 Excellent session gained worthy inputs for base as to follow Six Sigma in my professional career ahead.